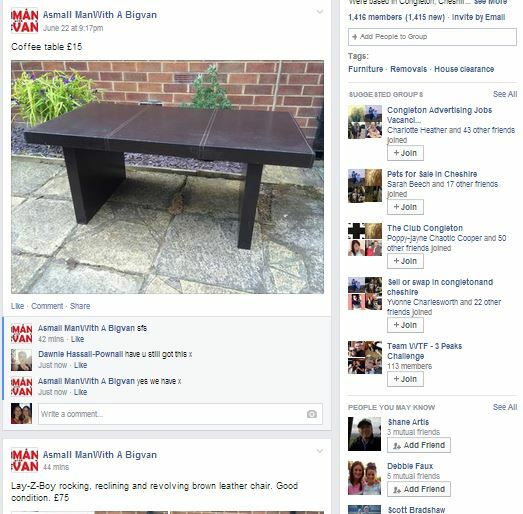 A Small Man with a Big Van has set up a new facebook group which will showcase all current second- hand furniture we have for sale in Congleton. Some great bargains available which will change regularly so keep checking back! We can offer a free delivery service for all customers in Congleton, a small charge my be added outside of Congleton depending on the furniture, please contact us to discuss. If you have any furniture in reasonable condition that you would like to dispose of please contact us. Likewise A Small Man with a Big Van is available for House Clearances, please ask for details. ← What do you look for when hiring a man and van? Very good shot and impossible to not appreciate the effort put into it.